Archibald Anderson third son of Matthew Anderson 1784-1867 and Jane Wanless 1787-1841 born 9 April 1815 at Lounges Knowe, near Alwinton, Northumberland, England. 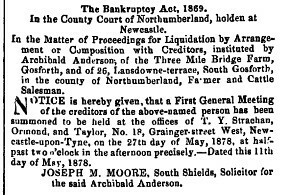 Apart from a record of his possible death, see below, Archibald, his wife and their son disappear from the records after bankruptcy proceeding against him in 1878, see below. Archibald married Jane Patterson on 30 May 1846 at Glasgow, Lanarkshire, Scotland though the transcript in findmypast.co.uk gives her name as Jean. At the time of the 1871 census 60yr old Alexander Patterson, gentleman born in Scotland was living with Archibald and Jane in Newcastle-upon-Tyne, Northumberland, England. Their only known offspring Matthew Thomas Anderson 1850-? : born 17 September 1850 at 13, Marlbro’ Crescent, Westgate, Newcastle-upon-Tyne, England also disappears from the records after 1871 UK census. The first agreement between Patrick Crean and Ephraim and Archibald Anderson for the lease of Hollybrook, Co Mayo, Ireland and associated farmland was dated 30 August 1851. 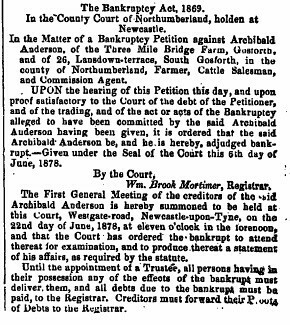 [Carolyn expects to have permission to show transcripts and images of the agreement by August 2016] As Archibald and his family were living in Marlbro’ Crescent, Westgate, Newcastle-upon-Tyne, Northumberland, England at the time of the 1851, 1861 and 1871 English censuses it is reasonable to assume that Archibald did not move to Ireland with his brothers. In 1866 Archibald assigned his portion of the lease to Ephraim. In 1851, 1861 and 1871 census returns Archibald describes himself as a ‘cattle salesman’ but by 1878 Archibald was a “Farmer and Cattle Salesman” connected to Three Mile Bridge Farm in Gosforth, 4 Km north of the centre of Newcastle-upon-Tyne. Three Mile Bridge Farm was in the area close to, even maybe within the present City of Newcastle and Gosforth golf courses, but in the 19th century it would have been better known for its collieries. By 1878 Archibald has also moved from Westgate, just to the north west of Newcastle city centre out to South Gosforth and was living at 26, Landsdowne Terrace. This was obviously a financial disaster as Archibald is declared bankrupt and the family seems to disappear from official records. Archibald’s funeral? On 29 Aug 1893 Arthur Oram recorded in his diary that he had received a “telegram announcing death of Archibald Anderson”. On 31 August Arthur attended the funeral at Hollybrook, Ephraim Anderson’s home in County Mayo, Ireland where Ephraim had died a month beforehand. Arthur did not specify the graveyard and Archibald’s name is not included on the Anderson headstones at the Church of Ireland graveyard Mayo Abbey. This is the only mention of an Archibald Anderson in Arthur Oram’s diaries. Therefore we do not know if the Archibald being interred was the brother of Ephraim or another relation. Where did Archibald, Jane and Matthew go after Archibald’s bankruptcy? When and where did Matthew died, and did he marry and have offspring? Archibald and Jane spent the rest of their lives at Hollybrook, but no sign of Jane’s death in the Irish records. Archibald and Jane join the relations in USA where Jane died and Archibald returned to Ireland where he died. Second or maybe third daughter of Matthew Anderson 1784-1867 and Jane Wanless 1787-1841 born 4 June 1817 at Lounges Knowe, near Alwinton, Northumberland, died at Knockroe, County Mayo, Ireland on 14 December 1897 and buried with her father Matthew, Church of Ireland graveyard Mayo Abbey, Co Mayo, Ireland. No marriage, no issue. It is not known when she moved to Ireland. In the 1850s she may have lived at Brize with her father Matthew and her eldest brother John and his family. The family story is that Margaret was the one person who spoilt the happy atmosphere at Knockroe where she lived with John’s widow Margaret, their unmarried daughters and James Cowan lived.